The second US customer for Goss International's innovative Magnum Compact press is attracting publicity following the commissioning of its brand-new US$10 million, 3300 m2 printing plant. 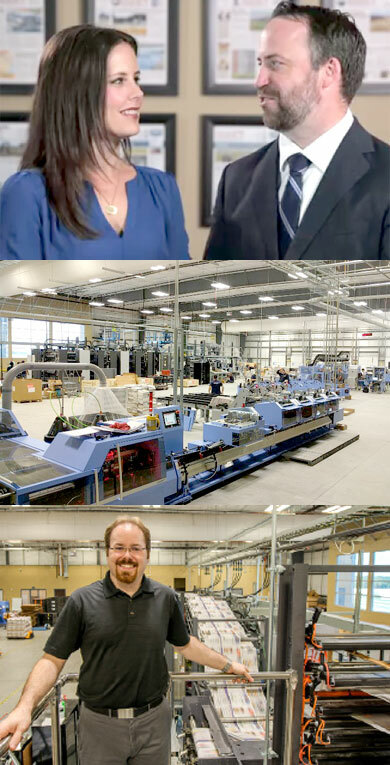 Community Impact Newspaper founder and chief executive John Garrett even dedicated a medium.com post to why he and his wife Jennifer were building a printing plant in 2016, joining and referencing Tow Center founding director Emily Bell on the "high risk" newsmedia industry. The company commissioned its state-of-the-art plant at Pflugerville, near Austin in Texas, last October on the strength of ten years of launching local community newspapers... at a rate of one about every nine months. For the tech-minded, the Goss press - modified to print three tabloid pages across what is a typical "single-width" web - is supported by Rima and Müller Martini mailroom and stitch/trim equipment, and a plateroom equipped with Nela punch-bending. The press is said to be one of only four of its kind in the world - the others are in New York, Sri Lanka and Mexico - and is able to switch from one full-colour edition to the next in a couple of minutes, but that apart, the kit is pretty standard. What's unusual, at least in the North American market rather than say, India, is that it is a new installation in a world where printed newspapers and the presses that print them, are being shut down. Community Impact, which publishes 22 free-distribution newspapers totalling more than 1.6 million copies through Austin, Houston, and Dallas/Ft Worth. And notwithstanding the recent appointment of a chief content officer, Garret is a believer in print: "We believe in strong community journalism that is useful and informative, and we believe in owning our own technology and fate." Indeed most readers "don't even know we have a website," he says. "I live in Round Rock, close to the burgeoning technology hub in northwest Austin, and over and over again people tell me that our paper is the only thing they read. "Turns out the printed word isn't just for 'old people'." Garrett says the company's growth depends on its printing plant. They were outgrowing their previous contractor, and the day he returned from a visit to inspect his new press, the local daily in Austin announced they were shutting their printing plant. Printing inhouse allows Community Impact to exploit its system for targetting advertisers' messages in a response to Facebook and Google becoming more and more local: "Chasing technology platforms has been brutal," he says. "You sprint to get on every platform you can because you have local relationships, and then Google and Facebook reward you for placing ads on their site instead of your own newspaper with $0 commission." But he says that in the battle for eyeballs - "coffee table vs mobile - print can still compete and win: "If my prospect wants to reach someone in her 30s with a good household income who lives near their store, I can compete with and beat Facebook and Google. This new equipment I'm buying combined with our homegrown targetting technology is great at household targeting. "But if my prospect only wants to reach someone in her 30s, good income, and who drives a red Ford and likes Metallica, I will lose that one. The good news for our future is that most of Main Street businesses and local advertisers need to reach those around their stores. We can win with this goal. "And any large advertiser that understands the importance of community marketing wants to be where local is." Garrett says that while digital is "part of our future", it doesn't pay the bills, and adds, "I can't build our entire digital future on another company's platform because the platforms are so critical to our future. This path is on the way to slavery on their platform." Owning their own printing plant has shown Garrett how important owning the platform is: "When you own the platform, you own your future," he says.